The contemporary U.S. worker cooperative movement is somewhat ambiguous about its relationship to capitalism. Members of our movement today range in perspective from viewing cooperatives as an anti-capitalist tool of struggle, "embodying the world that we seek to build," to seeing them as worker-empowering additions to an economic system believed to be either inevitable or in need of only minor modification. While empathizing with those who feel a sense of "inevitability" in the face of today's powerful capitalist economy (and disagreeing with those who see it as generally acceptable), I hold firmly to the perspective that a more just and democratic economy is both necessary and possible. And I believe that the greatest chance of increasing and assuring viability for the workplace democracy movement may rest in our ability to keep our "eyes on the prize"; that is, on the long term replacement of capitalism--an economy which socializes costs and privatizes benefits--with an economy of democratic cooperation in which costs and benefits are democratically and equitably shared throughout society. The worker coop movement cannot, by itself, take on the gargantuan task of challenging the culture of competition and greed. Operating as isolated businesses or even as networks of businesses, worker cooperatives have barely a prayer (contrary to what some cooperative activists suggest) of growing to "eclipse" and replace capitalist enterprise simply through successful growth and competition. Without compromising the very democratic, cooperative and justice-seeking core of our movement, we will not "out-compete" the masters of greed and competition on their own terms. We must, instead, work to transform the very terms of the economic game. Such a task will require more than savvy cooperative business practices in the face of capitalist competition. The worker coop movement must work to build broader alliances, holistic economic and social visions, and contribute to the creation of not only more worker coops, but a transformative social movement capable of changing the culture and economy--the "social ecosystem"--in which worker coops struggle to exist. Embedded in a larger context of social change, worker cooperatives can increase both their viability and their effectiveness as change agents. This does not mean that we shouldn't play the capitalist game as it now stands. Operating successfully in a capitalist market, worker coops can support movements for social and economic transformation, and achieve victories that no solely oppositional "resistance movement" can ever achieve. To be truly effective, however, these support activities and victories must be placed in the context of a movement for social, economic and ecological justice much larger than the "worker co-op movement." This broader context requires a holistic movement to create a cooperative solidarity economy and a democratically transformative "culture of change". Let's begin with the need to build a wider economic movement: Worker cooperatives are a particular--and effective--structure for democratically organizing the production of goods and the provision of services. Yet contrary to the inclinations of many on the left, we cannot build a different economy and society simply by advocating for alternative institutions of production. An economy is an ecosystem, a cyclical whole that includes processes of creation (the "original production" of natural resources by geological, biological, and energetic forces), production (human transformation of resources into goods and services), exchange, consumption (perhaps more appropriately called "use"), the processing of waste, and the recycling of surplus (sometimes called "investment"). Appropriate to this holistic picture, movements working for a just and democratic economy must generate interventions--and link these interventions together--at every point of the economic cycle. Indeed, to create conditions under which their success is increasingly possible, worker cooperatives must work to generate, sustain and support institutions at all other points of the economic cycle. Only through inter-cooperation and solidarity with other economic sectors will worker coops become viable, long-term institutions of social and economic change. Why? Because organizing across the entire economic ecosystem and building a broader social movement is actually the work of constructing reliable markets--"solidarity markets"--for goods and services produced by worker cooperatives. Inter-cooperation and movement building is about worker coops moving from a passive place of "entering markets" to an active place of constructing them. Such work feeds the "bottom-line" of the financial ledger and advances the cause of social and economic justice. Building these wider economic connections is crucial. But even a solidarity economy movement cannot succeed without being intimately linked to broader social change work. It is our connections with the work of anti-racism, feminism, queer liberation, environmental justice, ecological sustainablility, immigrant's rights, counter-recruitment and peace advocacy, labor organizing, grassroots community development, and other movements for cultural and insitutional change that will generate the collective power and momentum needed to effect long-term transformation and generate widespread, committed support for worker cooperatives as economic and social-change insitutions. Such work is already apparent throughout the worker coop movement. Green Worker Cooperatives in the South Bronx is making connections between worker control, environmental justice, and other crucial issues facing urban communities of color. Democratically-controlled collective bookstores and infoshops such as Red Emma's (Baltimore, MD) and Wooden Shoe Books (Philadephia, PA) are overtly supportive of movement-building work and actively support other social justice efforts by providing venues for public meetings and discussions and distributing educational information. Technology cooperatives such as Electric Embers (San Francisco, CA), Riseup (Seattle, WA) the Gaiahost Collective (Shutesbury, MA), C4 (New Orleans, LA), and the Brattleboro Tech Collective (Brattleboro, VT) contribute significant resources to support diverse movement-building efforts with information technology. And the list could go on: many other worker cooperatives contribute to social justice efforts at many levels and in many forms. These examples stand out as pioneers of cross-sector movement-building. Yet the worker coop movement has yet to integrate such visionary connective work into its core practice and identity. 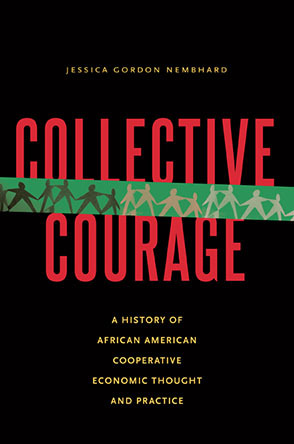 In this spirit, the U.S. Federation, along with its constituent local and regional networks, could do much to promote a culture of connection between the worker cooperative movement and other groups and movements working towards a broad vision of social, economic and ecological justice. Let's build this vision into our work and into our ongoing debates and conversations about the future of the U.S. worker cooperative movement. The possibilities are numerous and exciting. It is not easy work, of course--especially considering the demands placed on worker-owners by a cut-throat competitive market--but it is the work that we as cooperators must embrace if we choose to believe that another economy, and another world, is possible. Ethan Miller is a writer, musician, subsistence farmer and organizer. A member of the GEO Collective, and of the musical collective Riotfolk, he lives and works at the JED Community Land Trust, a land-based mutual-aid cooperative in Greene, ME. Email him.